An Emory tradition established in 1935, a Festival of Nine Lessons and Carols offers a candlelit service of choral music and scripture. Emory Photo / Video. Emory University welcomes the holidays with a slate of family-friendly performances sure to warm your heart and brighten your season. Events are scheduled for both the Emory campus in Atlanta and the Oxford College campus in Oxford, Georgia. A community favorite, A Festival of Nine Lessons and Carols will take place on Friday, Dec. 5, at 8 p.m. and on Saturday, Dec. 6, at 4 p.m. and 8 p.m. in Glenn Memorial Auditorium. 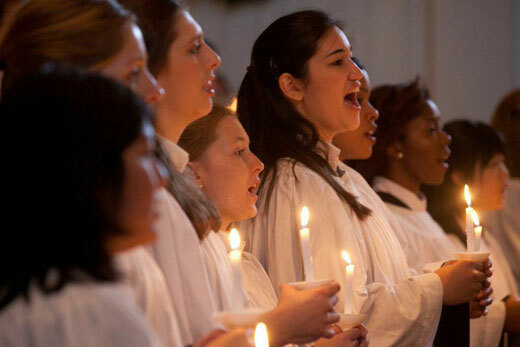 Since 1935, this stunning candlelit service brings Emory and Atlanta community members together as the Emory University Chorus, Concert Choir and special guests sing Christmas favorites and read lessons from the Old and New Testaments. Tickets: $20; $15 discount categories; $5 Emory students. This year marks the 30th anniversary of Christmas with Atlanta Master Chorale, with performances on Saturday, Dec. 13, at 8 p.m. and Sunday, Dec. 14, at 4 p.m. in the Schwartz Center for Performing Arts. This heartwarming performance is a wonderful way to welcome the season of joy. Tickets: $30; discount category members $25; and Emory students $10. Another holiday classic, Santa's Favorite Chamber Music, is on Sunday, Dec. 14, at 4 p.m. in Michael C. Carlos Museum. Santa will be there to introduce some of his favorite holiday pieces and hand out early Christmas treats to good listeners. This concert is a part of Emory Chamber Music Society of Atlanta's Family Series and is free and open to the public. For tickets and details call 404-727-5050 or visit Arts at Emory. Enjoy holiday concerts by the Oxford Chorale on Thursday, Dec. 4, and Friday, Dec. 5, at 8 p.m. in the Oxford Chapel. Accompanied by the Oxford String Ensemble and other musicians, the Oxford Chorale is composed of student vocalists and directed by Maria Archetto, associate professor of music. This event is part of the Oxford Studies series of concerts and lectures. Sponsored by Oxford College's Pierce Program in Religion, Meridian Herald's 22nd annual Southern Folk Advent Service is set for Saturday, Dec. 6, at 4 p.m. at Old Church, 1011 Wesley St., Oxford. The Sonny Houston Bluegrass Band will provide bluegrass Gospel music. Opera star Morris Robinson and Atlanta tenor Timothy B. Miller, famed for his Atlanta Braves home game appearances, will sing the folk hymn "The Morning Trumpet," backed by the Meridian Chorale in Steven Darsey's arrangement. Speaking will be Emory trustee emeritus Bishop William Willimon, professor of the practice of Christian ministry at Duke University Divinity School. Admission is free.